Lydia C. Davis was born on 10 Apr 1825 in Charleston, Montgomery County, New York to John D. and Gertrude "Gitty" (Smith) Davis. She married Joseph Fittshur at Sloanesville, Schennectedy County, New York on 30 Nov 1851. Their son Leroy was born in New York in 1853, and their daughter Jane was born in 1855 on their way to Wisconsin. They were in Forestville, Door County by the fall of 1856, when Lydia started the first tailor shop there. Josephine was born on 17 Jul 1858. Lydia filed for divorce from Joseph, stating that he deserted his family on 1 Mar 1860. On 16 Aug 1860 "he burned his house and left the state after threatening to shoot her. His whereabouts are unknown." The divorce was filed on 12 Jul 1861, File 1. This was the first divorce in Door County. Lydia remarried to Nathan Harrison Rockwell, and they had a son Nathan "Harrison" Rockwell, III. 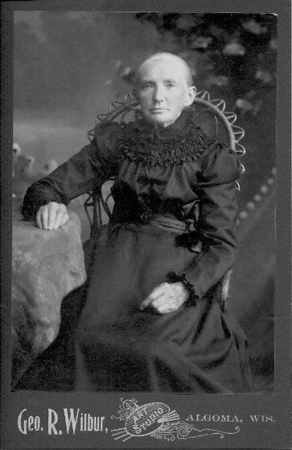 Lydia lived with Harrison's family until her death on 18 Jun 1917 at the age of 92. She is buried in the Forestville Town Cemetery in Maplewood, Wiscosnin.